Conspiracy theorists claimed the US military had captured a crashed alien aircraft, but “The Man” maintained it had merely recovered debris from a top secret surveillance balloon. 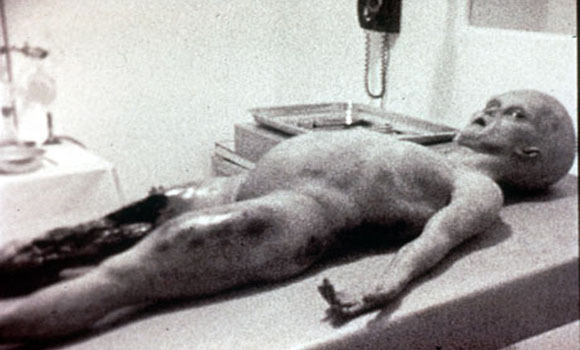 Ask Ant & Dec – they made a film about it: 2006 flop Alien Autopsy. A sighting from the Belgian UFO wave (29 November 1989 to April 1990). Over five months, 13,500 people claimed to have witnessed large, silent, low-flying black triangles, and around 2,600 of them filed written statements. Sceptics blame helicopters or mass delusions caused by eating chips with mayonnaise. More than 200 students and teachers at two Melbourne schools saw a flying saucer descend into a grass field, then ascend over a local suburb. There are no pictures, but witnesses still gather for reunions. Some of them are probably “spunks”. Others are “dags” who can “rack off”. 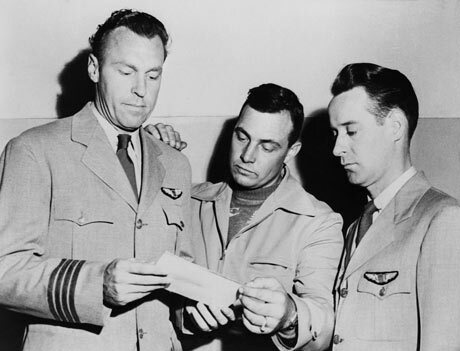 The press first coined the term “flying saucer” after this Idaho pilot claimed he had seen a string of nine shiny, saucer-shaped objects flying at supersonic speeds near Mount Rainier, Washington. What’s the frequency, Kenneth? 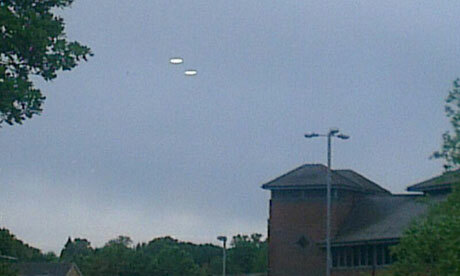 UFOs – flying discs – spotted in the sky over in Bracknell in 2013. Earlier this month, two glowing discs were photographed hovering near Bracknell, Berkshire – in the skies above a pub, spotted by a drinker in the beer garden. Hopefully he stared at the label on his bottle afterwards, like in the films. Presidents Jimmy Carter and Ronald Regan both claim to have seen UFOs. 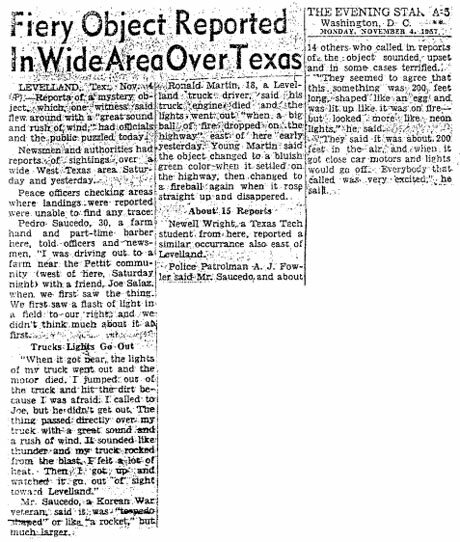 Carter was widely mocked for his 1973 sighting, but the man who eventually succeeded him in the White House also saw a mysterious object – in 1974 above Petersfield, California. Probably wisely, the wily old cowboy kept pretty quiet about it. Texas motorists reported their engines stalling after encountering a glowing, egg-shaped object – and that their vehicles restarted after it flew past. An investigation concluded that it was down to an electrical storm and “ball lightning”. Several witnesses spotted an “otherworldly” flying V-shaped craft, several city blocks across and with five spherical lights, in the skies over Arizona. Not to be confused with Phoenix Nights, which is a Peter Kay sitcom. Shabba! Twenty UFOs were spotted and detected by radar around Brazil but reportedly disappeared when military aircraft were sent to intercept them. Experts attributed the sighting to debris ejected by Soviet space station Salyut-7. Of course they did. They would. Right, guys? Guys? 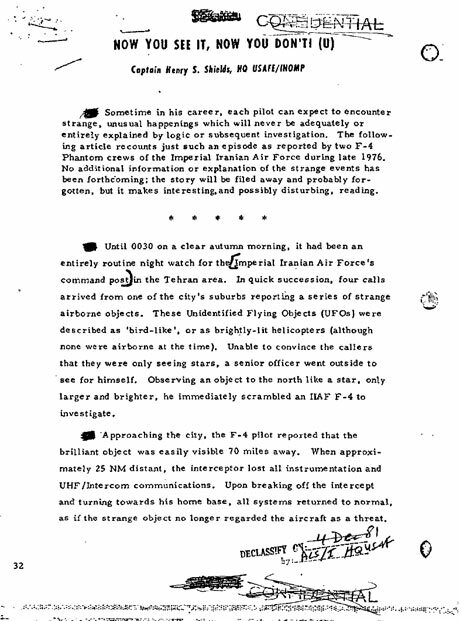 US military report into a sighting of a UFO over Tehran in 1976. A UFO allegedly whizzed over Iran’s capital, disabling the electronic instrumentation of two F-4 Phantom II jets and jamming ground control equipment. 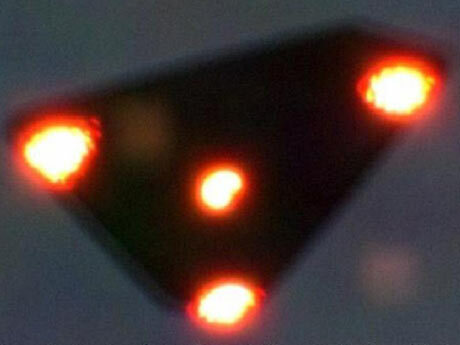 Iranian generals said on record that they thought the object was extra-terrestrial. Don’t tell Melanie Phillips. Will the U.S. Gov’t Target Whistleblowers With Drones?